I expected to gain a better understanding of insect photography principles and techniques at last weekend’s BugShot insect photography workshop at Shaw Nature Reserve in Gray Summit, Missouri. I even expected that I would walk away from the event with some new friends. The one thing I did not expect was the discovery of an apparently unreported host/parasitoid relationship amongst my beloved tiger beetles. Nevertheless, that’s exactly what happened in a patch of barren soil just outside of the Dana Brown Education Center where the event was being held. I had spied the small cluster of tiger beetle burrows the previous day as we left on our first group hike. The burrows were unmistakably those of Tetracha virginica (Virginia metallic tiger beetle) due to their size (no other tiger beetle in east-central Missouri approaches the size of this species), and in fact some of the larvae were seen sitting at the tops of their burrows. Tetracha larvae are easily distinguished from other genera of North American tiger beetles (in addition to their size) by their distinctive white-margined pronotum. I had to catch back up with the group but came back later in the day and took a few photographs of one of the larvae sitting in its burrow. Some of the other BugShot attendees were there and wanted to take photographs, but the larvae dropped on their less-practiced approach. No problem, I just “fished” a larva out of its burrow and let them take their photographs. When they finished, I began taking my own photographs, but I only got off one shot before the larva suddenly made a bee-line for its burrow and dropped in before I could block its escape. Oh well, I do already have photographs of the larva of this species from other locations. The next day I passed by the burrows again with Crystal and Lee. I really wanted them to see the larvae, but they were not active. No problem, I grabbed a long grass stem, chewed on one end, and inserted it to a depth of about 35 cm before it hit bottom. A little jiggling to get the larva to bite, then a quick jerk back and out came the larva. I never tire of seeing someone witness this for the first time—the way they jump back half-startled when they see the otherworldly larva flying through the air and landing on the grass. I grabbed the larva and placed it on the barren clay to let them take photographs. Crystal went first, and as she looked at the larva through her viewfinder she exclaimed, “there are wormy-things [the technical term, of course] on him.” Lee and I looked, and sure enough there were two small “wormy-things” attached to the back of the tiger beetle. I immediately recognized them as bee fly larvae (family Bombyliidae)—specifically Anthrax analis, the only bee fly known to parasitize tiger beetle larvae in the United States. I was quite excited by this discovery, as I have never seen these before despite fishing untold numbers of tiger beetle larvae from their burrows over the past decade or so. We all went camera crazy and took our turns photographing larvae and host, after which I popped it into a vial to keep for an attempt at rearing out the bee flies. It now seems that our find represents more than just a personal discovery, as bee flies—to my knowledge—have not yet been reported parasitizing any species of the genus Tetracha. Of the 70 Anthrax spp. for which hosts have been recorded (Yeates and Greathead 1997), only three are known to parasitize tiger beetles. Shelford (1913) gave the first account of A. analis (as Spogostylum anale) parasitzing Cicindela scutellaris lecontei, noting that the adult females lay their eggs by flying backward and downward while thrusting the abdomen forward until it touches the sand near the host burrow entrance. Hamilton (1925) found Cicindelidia obsoleta parasitized by this species, and Bram and Knisley (1982) expanded its known host spectrum to include C. hirticollis, C. tranquebarica, Cicindelidia punctulata, and Ellipsoptera marginata. 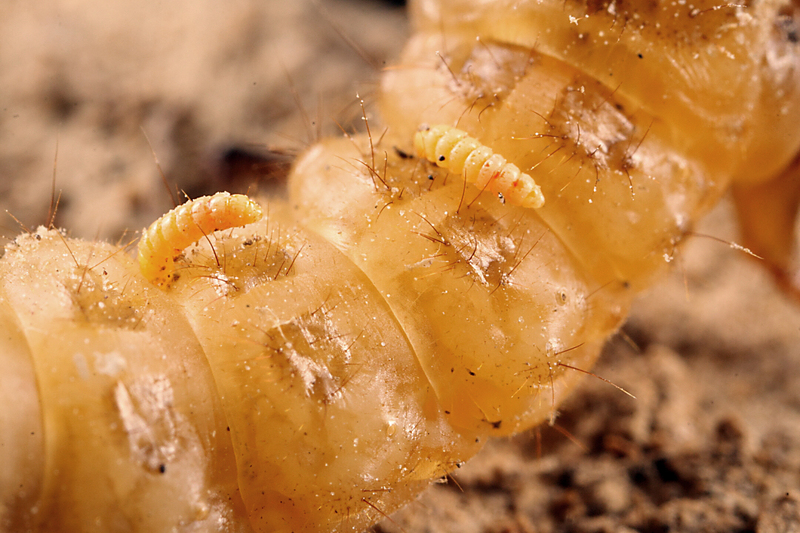 Photographs of larvae (presumably of this species) parasitizing undetermined tiger beetle larvae can be seen in Pearson and Vogler (2001) and in this photo by Chris Wirth. Anthrax gideon has been recorded parasitizing Pseudoxycheila tarsalis in Costa Rica (Palmer 1982) and Oxycheila trisis in Brazil (Arndt and Costa 2001), while a third undetermined Anthrax sp. has been reared from larvae of Pentacomia ventralis, also in Brazil (Arndt and Costa 2001). Oxycheila and Pseudoxycheila are related to Tetracha at the tribal/subtribal level (depending on which classification you follow), so the finding of A. analis utilizing Tetracha is not unexpected. The beetle larva and its unwelcome tagalongs is now in a container of native soil and has accepted the starter burrow that I made for it. Hopefully at least one of the bee fly larvae will complete its development and emerge as an adult to allow confirmation of its identity. If this host association does turn out to be unreported, we will follow up with at least a short journal communication. To that end, any literature citations you are aware of regarding bee fly parasitism of tiger beetles that is not listed below would be most welcome. Congratulations to Ben Coulter, who wins yet another BitB Challenge with 14 points (this guy is a machine! ), and Mr. Phidippus came close with 13 points. Ben and Phiddy were the only participants that figured out the parasites were bee flies of the genus Anthrax, and Phiddy was the only participant to guess the correct genus for the host. Ben’s win gives him a now commanding lead with 49 points in the current BitB Challenge Session #4 as we enter the home stretch. Mr. Phidippus and Roy are still in striking distance with 39 and 28 points, respectively. Is anybody capable of keeping him from his third title? We shall see. Arndt, E. and C. Costa. 2001. Parasitism of Neotropical tiger beetles (Coleoptera: Carabidae: Cicindelinae) by Anthrax (Diptera: Bombyliidae). Studies on Neotropical Fauna and Environment 36(1):63–66. Bram, A. L. and C. B. Knisley. 1982. Studies on the bee fly Anthrax analis (Bombyliidae), parasitic on tiger beetle larvae (Cicindelidae). Virginia Journal of Science 33:90. Hamilton, C. C. 1925. Studies on the morphology, taxonomy, and ecology of the larvae of Holarctic tiger beetles (family Cicindelidae). Proceedings of the U.S. National Museum 65 (Art. 17):1–87. Palmer, M. K. 1982. Biology and behavior of two species of Anthrax (Diptera: Bombyliidae), parasitoids of the larvae of tiger beetles (Coleoptera: Cicindelidae). Annals of the Entomological Society of America 75(1):61–70. Pearson, D. L. and A. P. Vogler. 2001. Tiger Beetles: The Evolution, Ecology, and Diversity of the Cicindelids. Cornell University Press, Ithaca, New York, 333 pp. Shelford, V. E. 1913. The life history of a bee-fly (Spogostylum anale Say) parasite of the larva of a tiger beetle (Cicindela scutellaris Say var. lecontei Hald.). Annals of the Entomological Society of America 6(2):213–225. Yeates, D. K. and D. J. Greathead. 1997. The evolutionary pattern of host use in the Bombyliidae (Diptera): a diverse family of parasitoid flies. Biological Journal of the Linnaean Society 60:149—185. This entry was posted in Bombyliidae, Cicindelidae, Coleoptera, Diptera and tagged beetles, entomology, flies, insects, Missouri, nature, parasitism, science, tiger beetles. Bookmark the permalink. What great photographs and what a great story. Thanks for letting us follow your journey of discovery, Ted! Thanks Dave. Personally I think the photos wouldn’t be nearly as interesting without the backstory. Sweet. BTW-Knisley and Schultz (1997) mentions that only one Anthrax larva makes it to adulthood per host larva, so it might end up as an only child (my money is on anteriormost larva). I hope you’re successful. I’ve been considering keeping some noctuiid moth cats in hopes of rearing some tachinid flies to adulthood, but I haven’t gotten to it quite yet. Yeah, I saw that – part of me was thinking maybe I should pluck one of them to better assure success of the other, but then I’m sure that would’ve backfired! The tiger beetle larva is quite large – I’m hoping it is ready to pupate and that the change in venue will trigger that process, at which point apparently the fly larvae ramp up their own development and then pupate. Yet another case where my self-education is lacking. 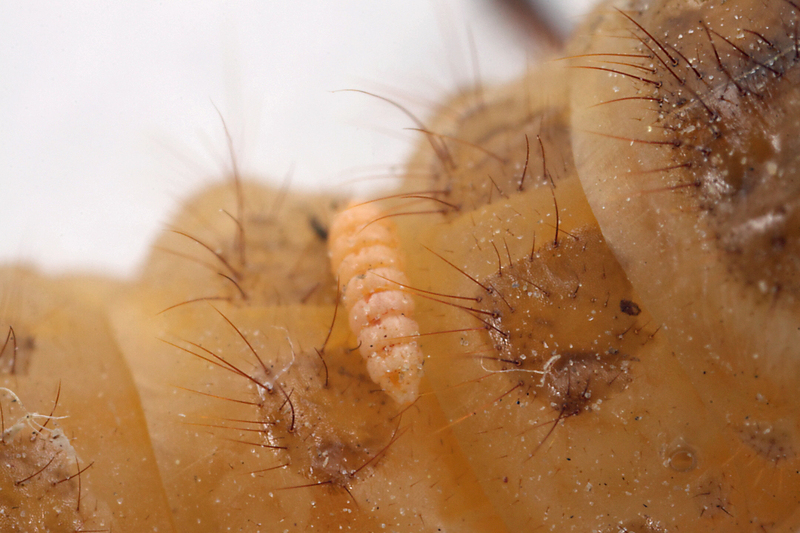 I had thought that bee flies only parasitized ground-nesting bees, not tiger beetle larvae. Which, thinking about it, sounds really dangerous for the bee fly. How on earth to they get their eggs laid in there without getting eaten? Most of the Anthrax spp. for which host associations have been determined do parasitize ground-nesting bees. That’s what makes this and the other couple or so species that are associated with tiger beetles so interesting. Presumably it would be an easy host shift from bees to beetles, as the two often nest together in the same habitats. 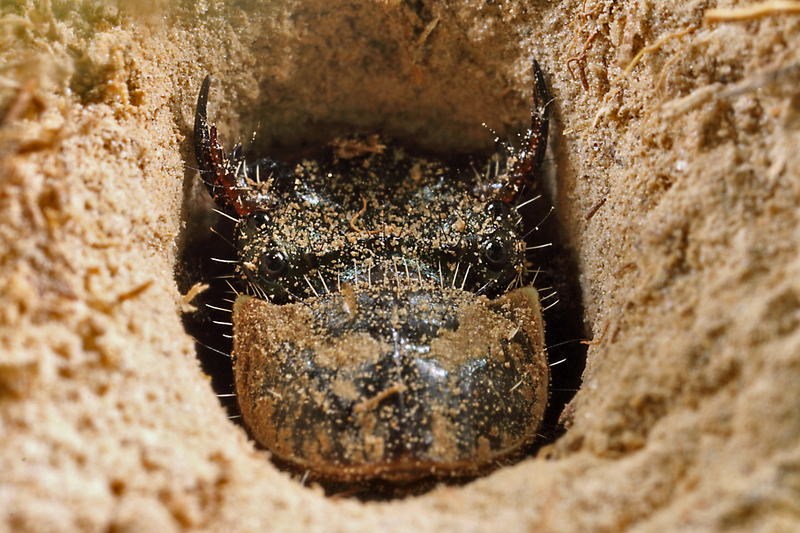 The adult avoids being captured by the beetle larva by only depositing eggs at burrow entrances in which the larva is not sitting at the surface. Tiger beetle larvae probably spend much more time down in their burrows than they do sitting at the surface. I suspect the fly can discriminate an occupied burrow by the neatly groomed edge and, thus, avoid wasting eggs on inactive burrows. That’s fantastic Ted! I had figured it was a dipteran larvae of some sort, but was thinking more along the lines of Calyptrate taxa. Extremely cool find, and I wasn’t aware that bee flies parasitized tiger beetles either! Thanks, Morgan. It is not common for bee flies and would, I suspect, represent a fairly recent host shift. Dang, I almost said T. virginica! I guess I should have gone with my first instinct in this case. I hope you’re successful in rearing the Anthrax larva; I’d love to see some photos. Yep – it would’ve given you the win! I’ll definitely photograph the adult if it emerges. Amazing! I was going to ask about what was known about host shifts, but I see from the abstract to the paper by David Yeates and Greathead that ‘most observations are made by chance’. I guess that makes analysis difficult, but you’ve perked my interest enough to read the paper. Seems Crystal and you are part of a long tradition, too, and I hope you get an adult to round out the serendipity. I recall some work on hymenopterous parasitoids that suggested that microhabitat specificity was more important for some than the host occupying that microhabitat. Perhaps the ancestral Anthracinae was a hole-in-the-ground specialist and moved from beetles to bees when they came along and A. analis and the like have resurrected an ancestral behaviour? It’s hard to imagine how the majority of observations could be anything but serendipitous. I sure hope I get an adult also, although there is little reason to presume it is not A. analis (now if it was another species, that truly would be a discovery!). I’m curious why you think tiger beetles were the initial hosts rather than ground-nesting bees. Phylogenetically they both host taxa are likely relatively recent, and since the great majority of Anthrax species utilize bees it is tempting to regard that as the ancestral condition. Tigre beetles and Anthrax may be recent, but I was speculating on their ancestors’ behaviours. Beetles living on the ground and Brachycera were around a long time before bees. Weigmann et al. (2003, Syst Biol 52:754, Table 3) estimate that the lineage including bombyliids diverged 176-216 MYA, so if they were parasitoids of insects, it wouldn’t have been of bees. This is a molecular clock estimate, but there is a fossil assigned to Rhagionidae from 187 MYA, so it seems reasonable that ancestors of the ‘bee’ flies were around then and had another way of making a living. Yep, that makes sense – I was thinking more specifically about the genus Anthrax, but the ancestral bee flies certainly would have been using something besides tiger beetles or bees. Maybe hovering about above grasshoppers laying eggs and then depositing their own eggs afterwards? I just read through Yeates & Greathead and they seem to think that the basic approach to parasitoidism in Bombyliidae – dropping eggs on the soil and the planidium larva doing most of the host-finding work (even in the derived S-clade [Anthracinae being at the top of this clade] where females may oviposit in a nest entrance) – has tended to mitigate against host specificity. The host records they have compiled certainly are all over the place (even ant lions and tsetse fly pupae). Use of orthopteran egg masses is common, but they seem to think convergent opportunism may be in play and say “Within clade S the ancestral habit was probably ectoparasitoid on larvae in the substrate-zone, but the diversity of feeding modes in Mythicomyiinae precludes our identifjring an ancestral habit in this subfamily.” (p. 167). Well, more fun than I expected this morning, but time to do the weekend chores. Interesting indeed, and thanks for doing the heavy lifting for me. I thought bee flies parasitized aphids, but I know very little about these critters. The exciting thing is that there is so much still to be discovered, and some of the answers are close to home! Bee flies are almost exclusively parasitoids of soil-inhabiting insects. You might be thinking about syrphid flies, which are commonly predators of aphids during the larval stage. I learned a long time ago that there is still much to discover right here in my own backyard (the first new species I ever found was right here in Missouri). You just have to know what to look for and to recognize it when you see it. Sure makes life fun! Anne, I’m going to guess you are thinking of the (somewhat bee-like) hover flies – Syrphidae -whose larvae are aphid predators. But as in the bee flies- Bomyliidae – syrphids have a lot of variation of feeding habits as larvae. Some are aquatic, some live in ant nests preying on brood, aphid eaters, etc. Shoulda read Ted’s reply, eh? Cool find, thanks for sharing with us 🙂 Good luck rearing them! 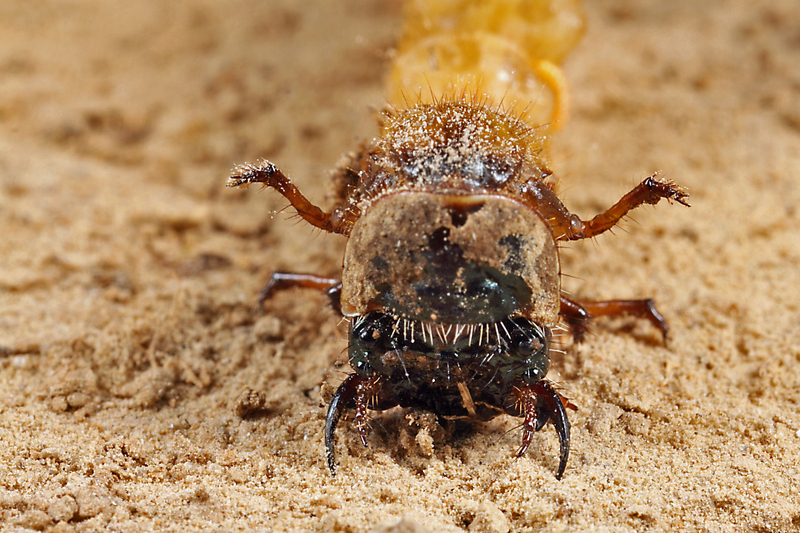 Thanks fatcat – the tiger beetle larva has redug its new burrow, so that’s a good sign. I’ll definitely be taking photos and posting them if I get the parasitoid to adulthood.